Charlton chief executive Peter Varney has denied he is stepping down due to pressure from the board. Varney has been at the Championship club for 11 years but announced on Thursday he would be leaving in June. "On Monday the shareholders will approve a bond issue to invest £14 million of their (the directors) own money," Varney told BBC London 94.9. "That would not be happening if there was boardroom unrest or if a purchaser was coming in, as has been suggested." "There is no foundation in that whatsoever. It is nothing to do with that. I think people that know Charlton know we have a terrific board of directors here under Richard Murray's leadership. "It's for personal reasons. I've been here for 11 years now and I sat down with the board of directors and told them that I thought this is a good time for me to move on. "Why this particular week is because we are having an extraordinary general meeting on Monday and it's very important that any material facts are known to shareholders before that bond issue is approved." 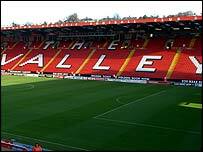 Charlton returned to the Valley in 1991 after a 16 year absence in which they ground shared with Crystal Palace and West Ham. The 26,500 ground has since been fully redeveloped and Varney says that is one of his proudest achievements. "I've loved every minute of it, I'm a Charlton fan and it's been a fantastic journey to have been in charge during the period where we turned it from a group of cattle sheds into a proper stadium and a proper football club. "I think when this (investment) goes through on Monday, that sorts out the financial issues that we had to address. "I think under Alan Pardew's stewardship and with the board here continuing to support the club in a massive way financially, my departure is not going to affect that at all and I'm sure Charlton is going to go from strength to strength." Varney says he's unsure of his own future and plans on taking a prolonged break when stands down. However, he thinks that Charlton, aided by the redevelopment of the South East London area, has the potential to grow into an even bigger club. He added: "With what's going on in this region in the next few years, with the Olympics and the building of about 150,000 homes on our doorstep in the Thames Gateway, there is a massive potential at this club. "Whoever comes in inherits a good club, a well run club and I think its something that with what's going on in the region that they could take it to new levels. "In this first year (since relegation) I'd be lying if I said it wasn't a pressured time but I still think Charlton will be back in the Premier League sooner rather than later and when it does the fact that this region is going to take off in the next few years gives it a massive opportunity."